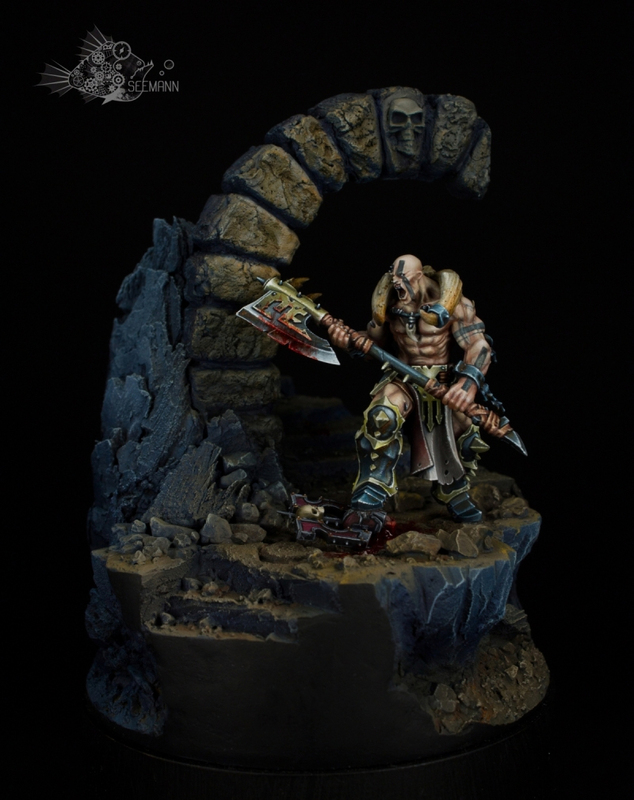 What an amazing mini. I have to thank Scruby and Wells for bringing this guy to my attention on Twitter this past week. There's just so much great stuff going on with it. First off, I am a fan of black armor on Bloodbound, it just looks suitably menacing. 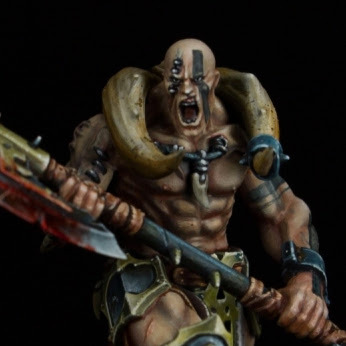 All of the painting on this guy is top notch with perfect blends on everything and great color choices. The skin is the perfect shade to contrast with the cooler blacks, and the NMM (non-metallic metal) gold is also handled very well. I think my favorite part on the mini itself are the tattoos. The black of them helps tie the armor in nicely and the geometric shapes are a nice contrast to the otherwise mostly organic shapes of the rest of the model. They're at the same time modern looking and perfectly fitting for the setting. 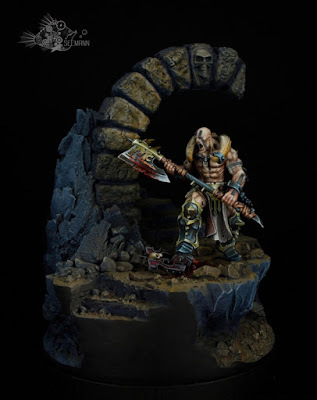 The "base" on this guy is great as well and really helps give it a sense of space.I can definitely picture this guy emerging out of some sort of cave temple dedicated to Khorne. The lighting effects on it are fantastic and really help emphasize the model. By keeping all of the colors muted and dark the model is framed by the base instead of overwhelmed by it. Really, I just love everything about this model.